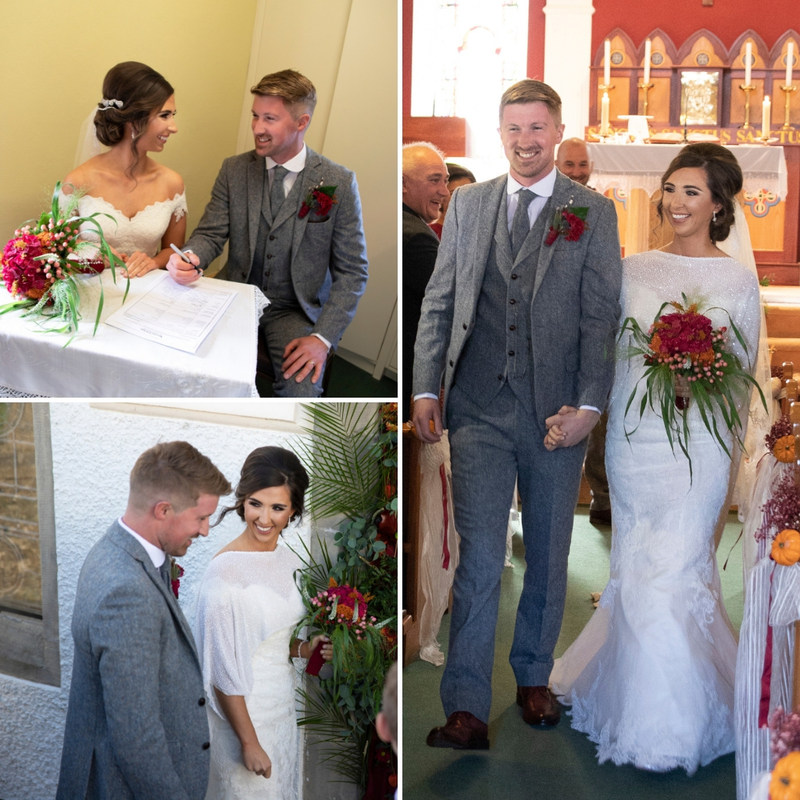 Aoife Deeny and Paul McKeefry met in 2013, when Aoife was on a Christmas night out with friends in Castlewellan, Co. Down. Her friends and her entered a pub on the historic street and bumped into Paul, who was just visiting his local with his brother. The hit it off instantly. 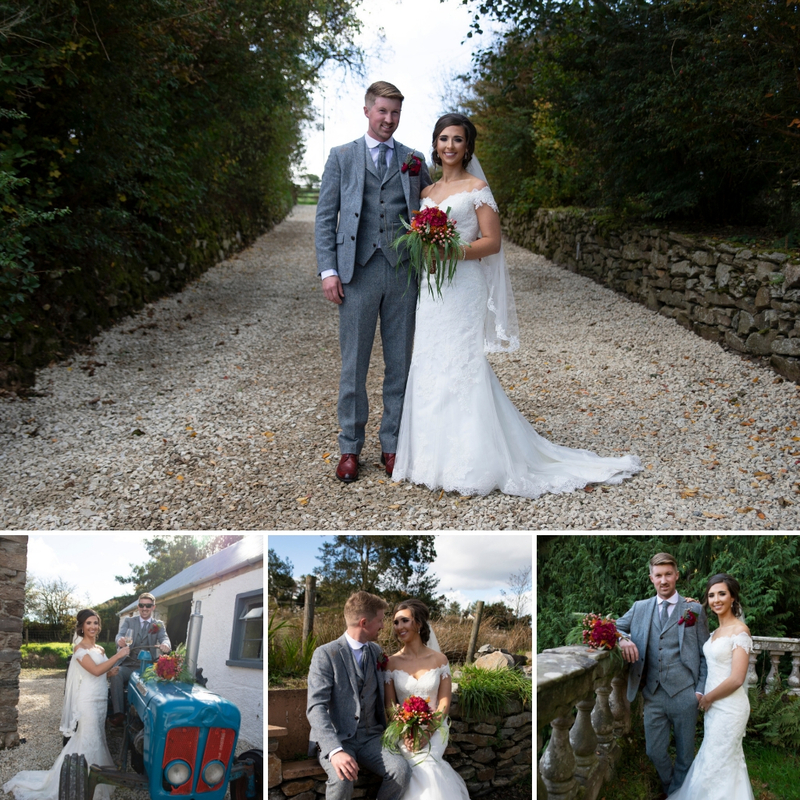 Paul and Aoife’s wedding reception took place at Drenagh House, Limavady, Co. Londonderry. Due to the time of year, Aoife opted for Autumnal and Harvest themes. Aoife chose a family friend to create her flowers for the day. 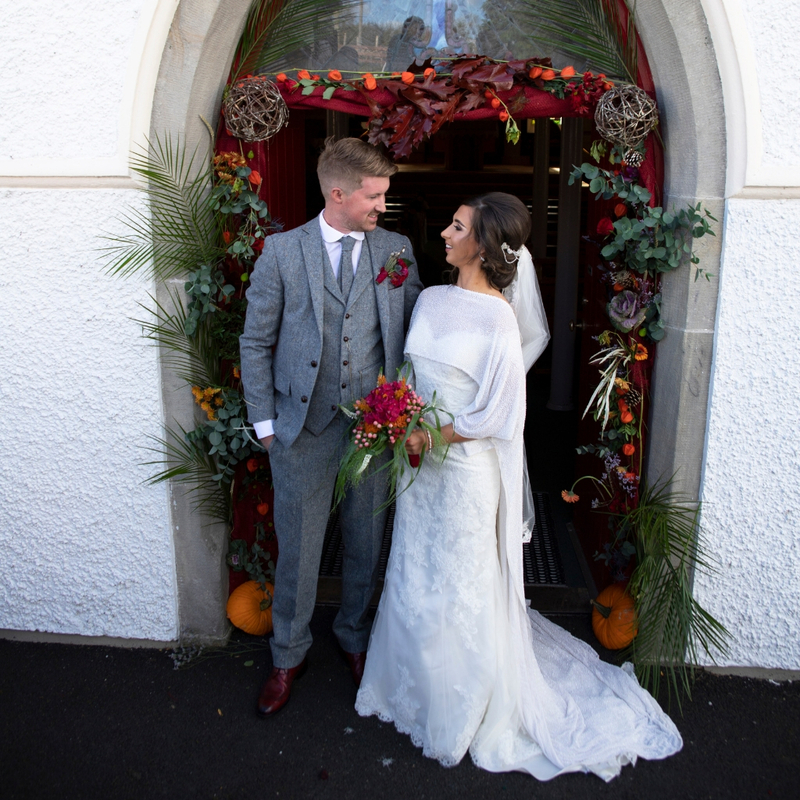 ‘The flowers were definitely my favourite feature of the day,’ says Aoife. 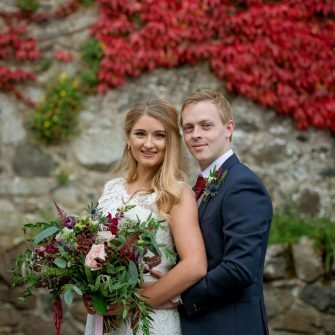 Using a mixture of warm reds and oranges for the bouquets, the florist kept in theme with Aoife’s Autumnal look. An arch of flowers also featured at the church which the bride loved. 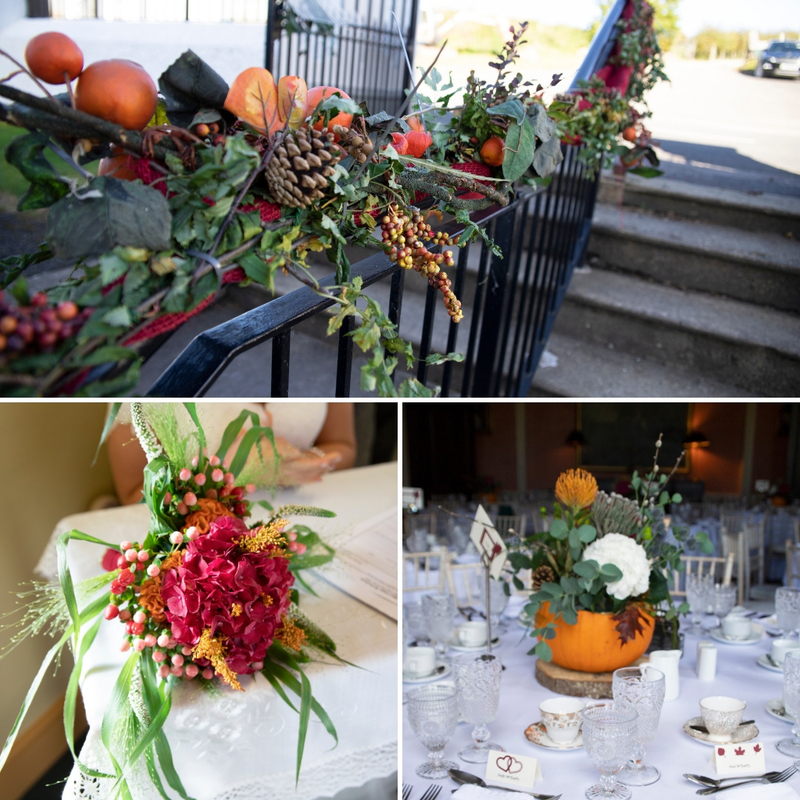 To keep with the Harvest theme, the florist scattered tiny pumpkins and conkers amongst the flowers. 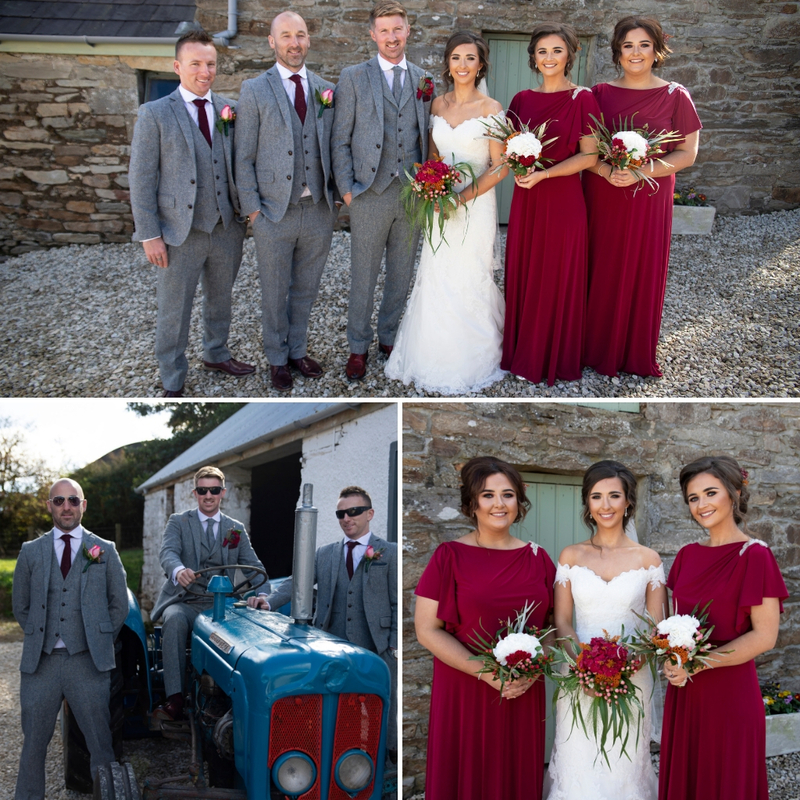 The men’s buttonholes all featured deep reds and pinks to give a bit of edge to theme. 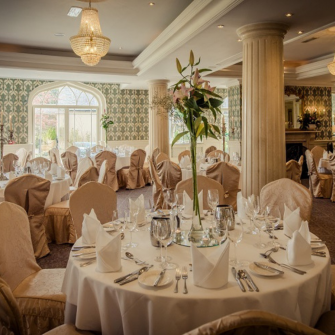 The intimate wedding consisted of sixty-five guests, meaning Paul and Aoife were able to have their dinner in the main room of Drenagh House. Aoife reveals she only had to add the centre pieces; pumpkins grown over the summer in their home that were filled with flowers, an idea Aoife got from Pinterest. Their table plan also tied in with the theme of the day; a tree with guest names on the leaves with fairy lights around them. 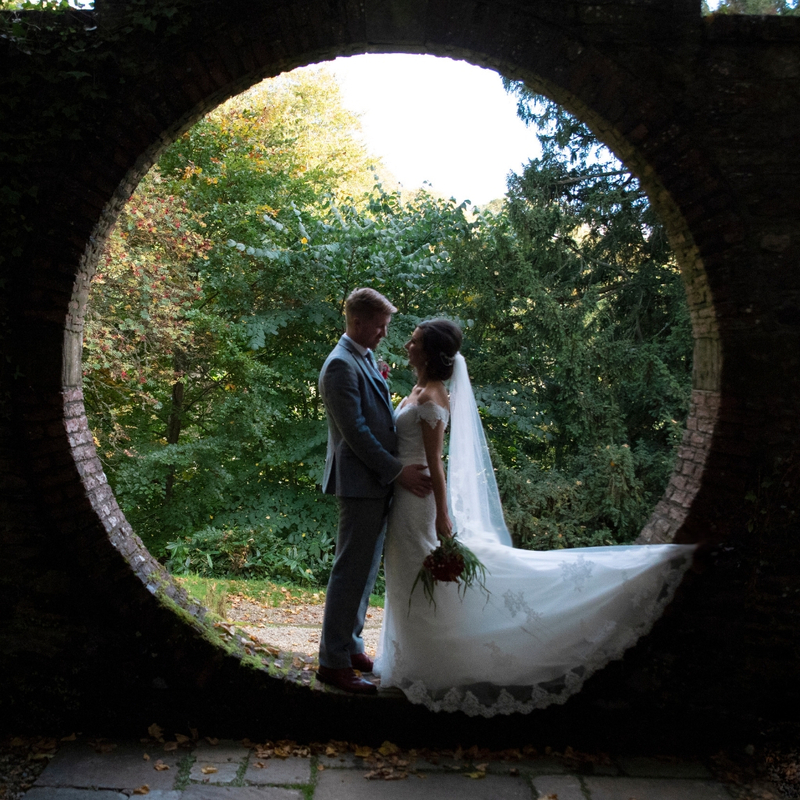 Paul and Aoife’s photographer was Heather Rose Photography. They chose her because Heather was the sister of a good friend. ‘We had seen some of her work and loved it!’ they add. 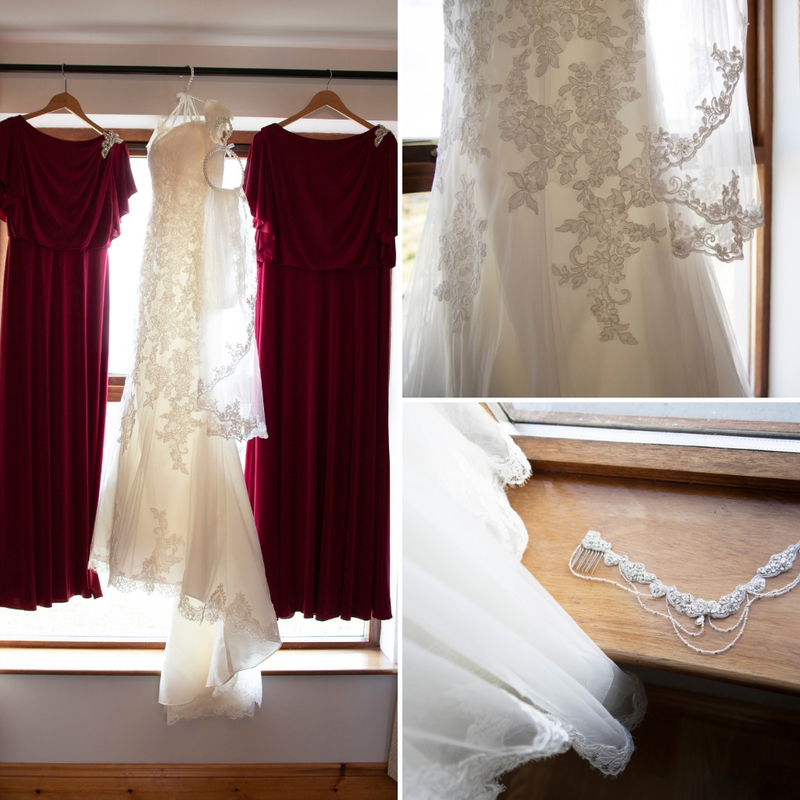 Aoife’s gorgeous dress was designed by Justin Alexander, bought from McElhinney’s, Ballybofey, Co. Donegal. Aofie can’t recommend them enough! ‘They were so accommodating and professional and made so much time for you.’ She was also able to get her alterations done there, which took all the stress out of picking a dress. Visiting McElhinney’s was third time lucky for Aoife, she knew what she wanted and McElhinney’s had it. 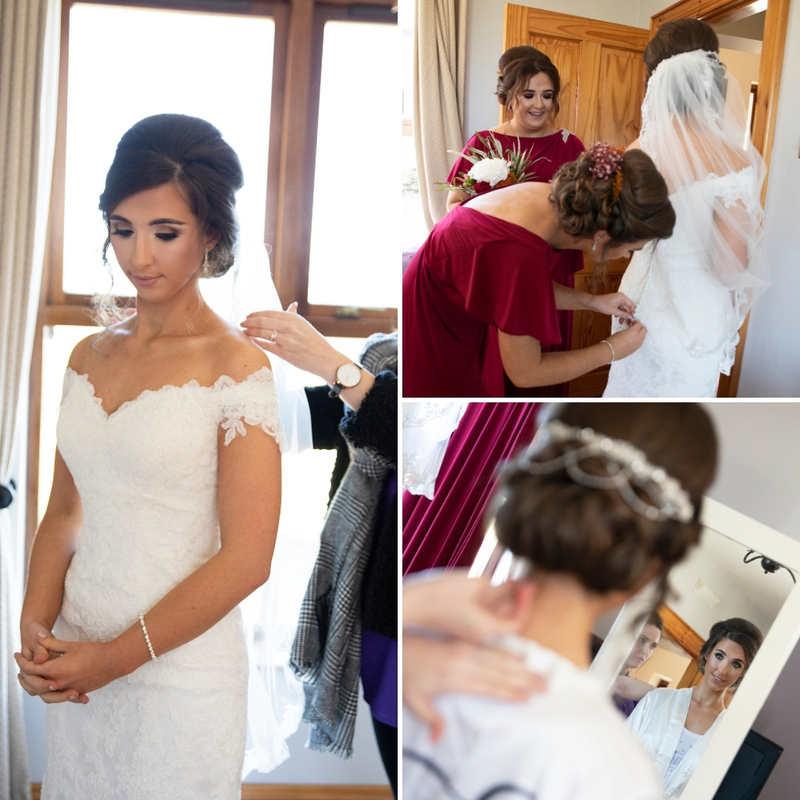 Aoife’s beautiful bridal look was achieved by makeup artist Bronagh Donaghy from Rural Retreat, Glack, Co. Londonderry and hairstylist Lauren Monaghan from Hair by Lauren, Dungiven, Co. Londonderry. 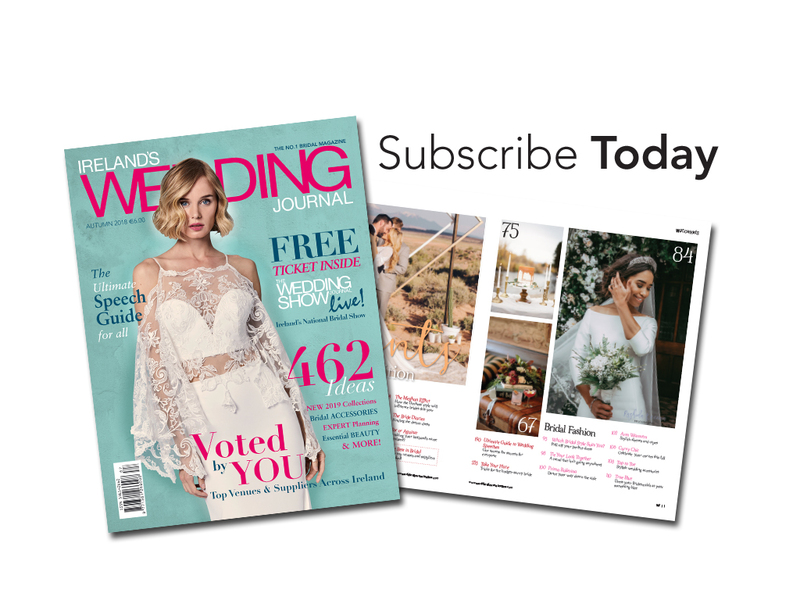 Aoife wanted to keep everything local and sourced the stylists from other local brides. ‘They were both brilliant, they came to the house and were so relaxed. I loved our looks. I felt like myself which was important to me,’ comments Aoife. 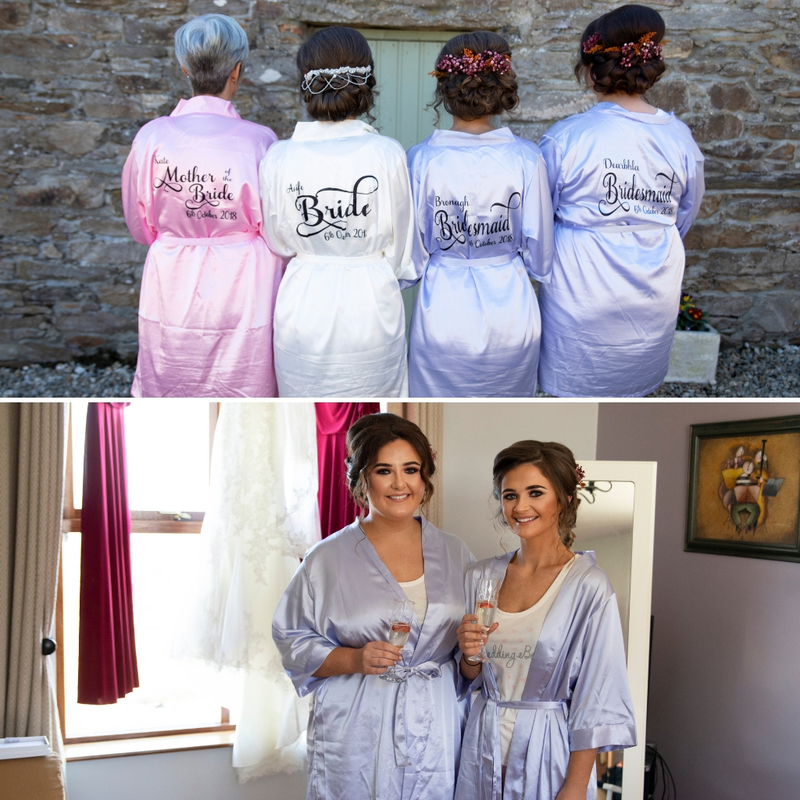 The two bridesmaids were Aoife’s sisters and she wanted something they would both be comfortable in. This was achieved in Perfect Day, Lurgan, Co. Armagh. They picked two dresses from the huge selection in store that were a rich autumn colour fitting for the theme. 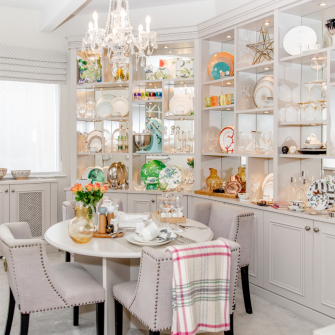 The guests enjoyed a delicious sit down three course meal. For starters they enjoyed a choice of minted pea soup or Chinese duck salad. Their main consisted of a choice of chicken supreme or roast beef. The desserts were scrumptious autumn treats of either apple crumble or sticky toffee pudding. For the evening supper, guests enjoyed pulled pork sliders after dancing the evening away. The wedding cake was baked and decorated by Paul’s mum. 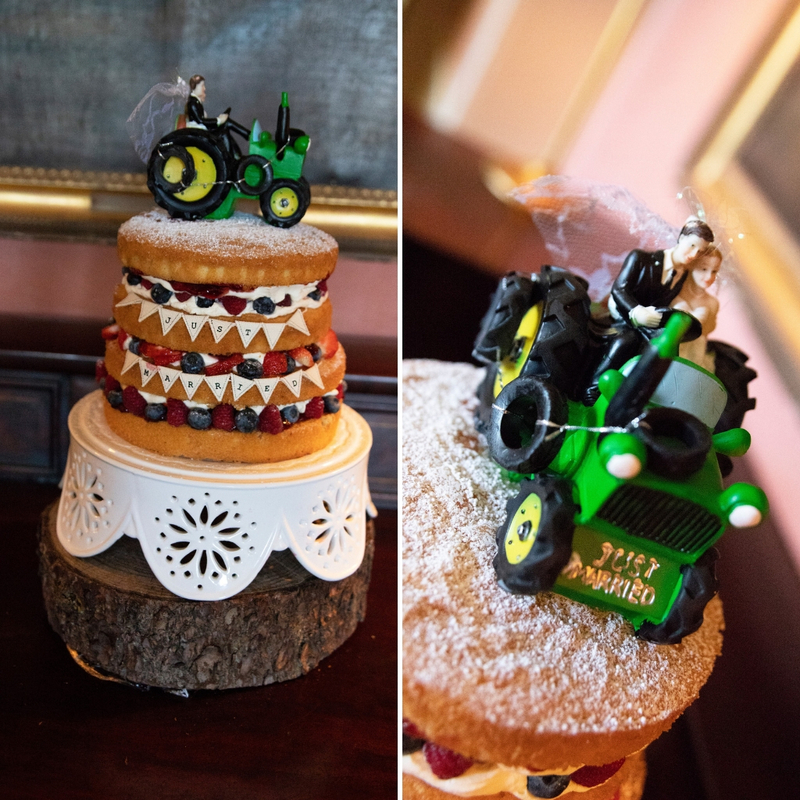 The sponge was Aoife’s favourite, Victoria Sponge and was subtly decorated with fresh fruit. 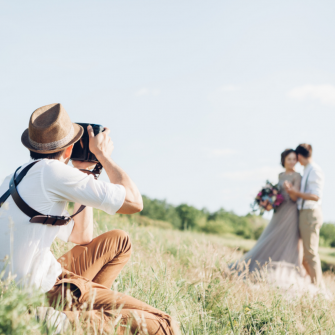 The bride and groom share the same favourite moments. The first moment was coming down the famous Drenagh staircase to be welcomed by all their closest family and friends. Their second favourite moment was the firework display after the dinner on that crisp, dry October night.